WATCH QUICK HOW-TO VIDEO & READ MORE BELOW! 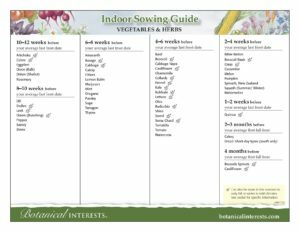 When you sow your seeds depends on your area’s frost-free date. Look at the back of your seed packets to find the time your seeds need to grow before they can be transplanted. Use this to count back from your area’s frost-free date to find when you should sow your seed. Example: On average our area’s frost-free date is May 14th. If your seed requires 8 weeks for proper germination, you should plant your seed around the week of March 19th. 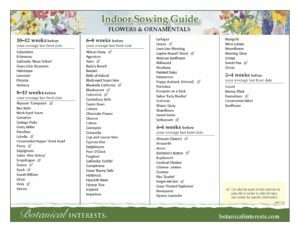 These great guides from Botanical Interests can give you a idea of what to plant when. Any type of container can be used as long as it is clean and provides good drainage. Peat pots are a great organic choice. They provide great drainage, air circulation and can even be planted into the ground. The best soils for seed starting provide good moisture retention, good drainage and nutrients, like our Miracle Grow Seed Starting Mixture – find it in store. For most seeds, temperatures of about 70°-75° are best, check your seed packets for specific variety requirements. Some seeds require more warmth, which you can achieve by using a heating mat or insulated trays. One-Step Method: Sow 2-3 seeds at the depth stated on the seed packet in individual containers. After the seeds germinate and show true leaves, pinch and thin out the smallest seedlings. Leaving only the strongest plant in each container. Two-Step Method: Sow seeds at the depth stated on the seed packets in a tray. When the seeds germinate and show true leaves, transplant the seedlings into containers to provide more room. 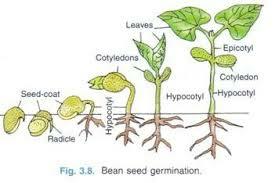 During germination, a seed will sprout up with two seed leaves. These are called cotyledons and are not true leaves. True leaves will emerge soon and more closely resemble the leaves of your seed. To increase moisture and humidity, use a plastic cover over your seedlings until the seedlings emerge. Then remove your covers. Misting with a spray mister will also help. Your seeds will need at least 14 hours of light a day. Place in a bright location, such as near a sunny window. Provide more light with florescent light bulbs (an inexpensive option), placing them about 2-4″ above your seedlings; however, it’s best to use a grow light tube. Etiolation is a term used to describe seedlings that are weak due to lack of light – the most common seedling issue. When this occurs, your seedlings will look pale in color, skinny & leggy, and have reduced leaf growth. If your seedlings start to show signs of this, provide more light. Don’t forget to label! 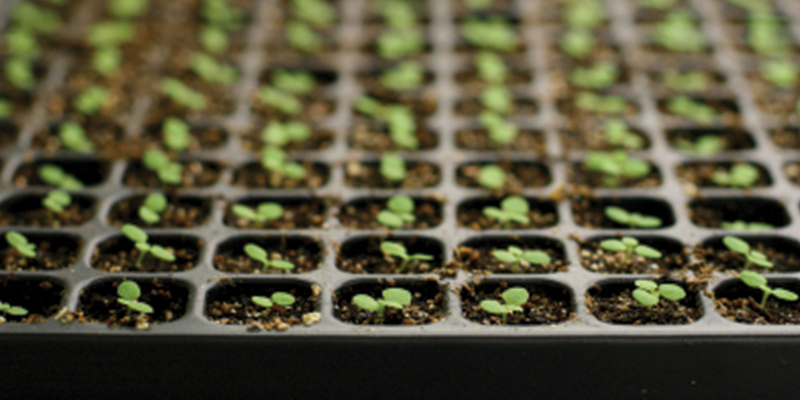 Most seedlings look the same at first and you could lose track of what’s what. Prior to transplanting, let your seedlings get used to the new light levels outside with a period of “Hardening Off.” Place them outdoors in a more shady location at first and gradually introduce them to more sun for about 7-10 days. Most seeds will want to be planted at the same level that they were in their pot. If temperatures are going to drop below 45° degrees at night, bring them inside if in the hardening off stage. If already planted, make sure to provide protection by covering them. *Seed starting supplies available at Prairie Gardens Champaign Location Only.